Earlier we reported the new August solicitations from Dark Horse that were posted by Comic Book Resources, however, TheForce.Net picked up something that CBR missed: Star Wars Omnibus The Complete Saga. 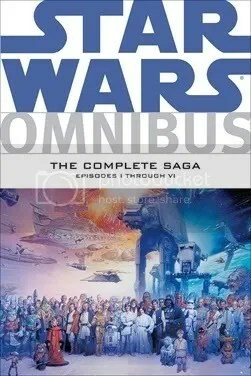 At 600 pages, this omnibus will collect Star Wars Episode I: The Phantom Menace; Star Wars Episode II: Attack of the Clones; Star Wars Episode III: Revenge of the Sith; Star Wars: A New Hope – The Special Edition (each of these was a four issue series done by Dark Horse); as well as Marvel Star Wars issues 39-44 which cover Star Wars Episode V: The Empire Strikes Back, and the four issue Star Wars: Return of the Jedi comic series also by Marvel. All of these comics have already been collected as trade paperbacks (and Marvel issues 39-44 were included in the A Long Time Ago… Volume 2 omnibus), but this will be the first time all of them have been gathered in one collection. The Star Wars Omnibus: The Complete Saga is set to go on sale October 12 this year.